BURLINGTON, Mass. — (BUSINESS WIRE) — January 3, 2018 — Desktop Metal, the company committed to bringing metal 3D printing to engineers and manufacturers, announced it has been granted seminal patents by the United States Patent and Trademark Office for its inventions in interface layer technology for both its Studio System™, the first office-friendly metal 3D printing system for rapid prototyping, and Production System™, the only 3D printing system for mass production of high resolution parts. Desktop Metal has exclusive rights to the patented technologies and adds these to its existing portfolio of over a hundred pending patent applications covering more than two hundred inventions. U.S. Patent No. 9,815,118 and U.S. Patent No. 9,833,839 cover the separable support layer technology used in the Desktop Metal Studio System, which began shipping in December 2017, and in its Production System, which is scheduled to begin shipping in late 2018. Additionally, the company owns several more pending patent applications covering other aspects of this technology. The Studio System is the first office-friendly metal 3D printing system for rapid prototyping and is 10 times less expensive than existing technology today. The Studio System is a complete platform, including a printer, a debinder, and a sintering furnace that, together, deliver metal 3D printed parts in an engineer’s office or on the shop floor. 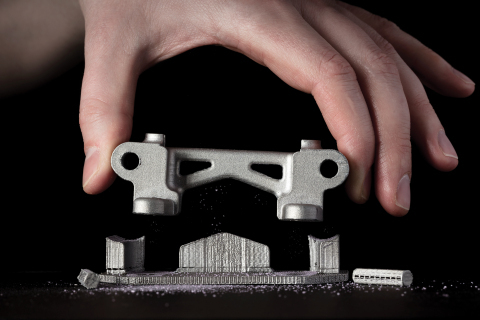 To manufacture metal 3D printed parts at scale, Desktop Metal also debuted the only 3D printing system for mass production of high resolution metal parts today, the Production System. Desktop Metal, Inc., based in Burlington, Massachusetts, is accelerating the transformation of manufacturing with end-to-end metal 3D printing solutions. Founded in 2015 by leaders in advanced manufacturing, metallurgy, and robotics, the company is addressing the unmet challenges of speed, cost, and quality to make metal 3D printing an essential tool for engineers and manufacturers around the world. Desktop Metal has raised over $200 million in financing, with the Series D marking the largest round ever for an additive manufacturing company. Among the company’s investors include GV (formerly Google Ventures), GE Ventures, BMW, Lowe’s, and Techtronic Industries (TTI). In 2017, Desktop Metal was selected as one of the world’s 30 most promising Technology Pioneers by World Economic Forum; named to MIT Technology Review’s list of 50 Smartest Companies; and recognized among the most important innovations in engineering in Popular Science’s “2017 Best of What’s New.” For more information, visit www.desktopmetal.com.